On Monday, August 11th of this year the Third International Firefly Symposium opened in Gainesville, Florida. Running through Friday, August 15th, the International Firefly Symposium attracted about 50 prominent firefly experts from a dozen countries. These experts disseminated and exchanged information about the amazing firefly, the most commonly encountered and widely recognized bioluminescent organism in the world. Sideshow freaks everywhere should be aware of this. 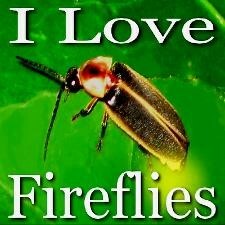 http://youtu.be/RpywSqvXDqc Fireflies, also known as “Lightning Bugs”, use bioluminescence to shine in the night and attract a suitable mating partner. These amazing creatures are nature’s pyrotechnic performers, bringing a sense of magic and mystery to our world. Man has been fascinated with the firefly for thousands of years. Over the centuries, fireflies have appeared in literature, poetry and folklore. Fireflies were discussed in Chinese writings as far back as 1500-1000 B.C. The main attraction to the firefly is its light production. Fireflies use a “language of light” to communicate with other members of the same species. The color of the light and flash patterns often varies between species. Firefly light is usually intermittent. This flash pattern is an optical signal that helps the firefly locate mates. The firefly lights are efficient “cool lights” where nearly 100 percent of the energy is given off as light. In contrast, incandescent lights use only about 10 percent of its energy in light with the rest given off as heat. The firefly light is generated in a bio-chemical reaction within dedicated light organs located under the firefly’s abdomen. The enzyme luciferase catalyzes chemical reactions between luciferin, magnesium, Adenosine triphosphate (“ATP”), and oxygen to produce light. This reaction is actually a two-step process where luciferin is first combined with ATP and magnesium to create luciferyl adenylate. The oxidization of the luciferyl adenylate then produces the firefly light. Fireflies are actually not flies, but are flying beetles in the family Lampyridae. 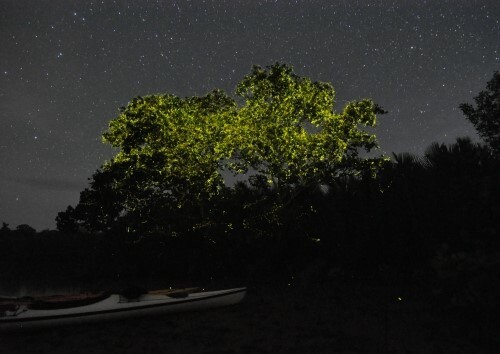 There are over 2,000 firefly species found worldwide. Tropical rainforests are a favor habitat for fireflies, but some species are also found in the temperature regions. The adults of most firefly species are active at night. There are also fireflies beetles that are active during the day; however, these diurnal species usually do not produce light. Most fireflies have a nasty taste, as a result of defensive compounds known as lucibufagins. These chemicals are similar to those found in some poisonous toads and can sometimes even be toxic to a predator. In the scientific community, the firefly serves as the model system for the study of bioluminescence. For this reason, the ecological, behavioral and morphological studies of fireflies are of great interest to the international scientific community. In 2008, the First International Firefly Symposium took place in Chiang Mai, Thailand. Bringing together people from around the world with a common interest in fireflies in a venue that was open to not only scientists, but also educators, naturalists and artists; the First International Firefly Symposium included artistic, educational and scientific activities involving fireflies. By providing such a venue for an international meeting, the organizers fostered collaborative partnerships between those interested in many different aspects of fireflies. This meeting represented an essential link in promoting fireflies and their conservation to a wider audience. Organized by the Forest Research Institute Malaysia (FRIM) and the Malaysian Nature Society, the Second International Firefly Symposium was held in Subang, Selangor, Malaysia two years later in 2010. The theme of this symposium was Firefly Conservation: From Science to Practice. With experts in taxonomy, genetics, biology, behavior, ecology and conservation of fireflies as well as members of government agencies, non-governmental organizations, educational institutions, corporations and the public, this symposium created “The Selangor Declaration”. This official document urged all the world’s government to protect, rehabilitate, educate, and promote the firefly habitats, as well as to support firefly research. Firefly conservation is in practice in many countries throughout the world. Public education, awareness and involvement are also found in many countries. However, protected areas specifically for fireflies are extremely rare. Four years in the planning, the 2014 International Firefly Symposium featured Dr. James E. Lloyd, Professor Emeritus, Department of Entomology and Nematology, University of Florida, Gainesville, Florida as the keynote speaker. Firefly research has been conducted at the University of Florida for over 30 years, due largely to the research programs of Dr. James E. Lloyd and his students. Dr. Marc Branham Associate Professor, Department of Entomology and Nematology, University of Florida was the conference host. Abner B. Lall speaking on Colors of the night: Do fireflies detect the color of their bioluminescence? This entry was posted in Uncategorized and tagged fireflies, great smokey mountain national park, sideshow freaks. Bookmark the permalink.